Not everyone has a story of how God has changed their life in a radical way, but GCU alumnus Brian Anderson does. Anderson came to the University more than 30 years ago as a nonbeliever and became a follower of Christ during his time as an Antelope athlete. Anderson is the senior pastor at Vineyard Church in North Phoenix, a megachurch that attracts nearly 4,000 in worship attendance every weekend. However, when he transferred to GCU on a full-ride baseball scholarship in 1978, after two years at Washington State University, he admits his focus was more on partying and playing than his faith. He didn’t fit the Christian lifestyle. At the University’s Chapel services, he heard the Gospel for the first time. As he spent time on campus, he became transformed and was saved on Nov. 4, 1979, in what he called a “Damascus Road” experience. At that time, GCU was a perennial baseball powerhouse among NAIA schools. The Antelopes dominated the 1979 season and were favored to win the NAIA College World Series. But an incident that became known as the “champagne debacle,” when players popped champagne corks in the locker room to celebrate a victory, forced GCU to withhold its team from participating in the postseason. Angered by the University’s decision, Anderson moved back to his native Washington after the season to search for another school. With only a year of eligibility remaining, no prospects panned out and he elected to return to GCU for his senior year. With his help, the ’Lopes went on to win the NAIA championship in 1980 in Dave Brazell’s final season as coach. That team went 56-14-2. Keith Baker, GCU’s director of athletics, pitched for the team in 1980-82 and credits Anderson as one of the keys to the team’s success. After graduation, Anderson served as a GCU assistant coach for three years under the legendary Gil Stafford. He received a degree in mathematics from GCU and taught at Deer Valley High School for 10 years while also serving as the school’s baseball coach. Although he loved coaching, he felt God calling him into the ministry. 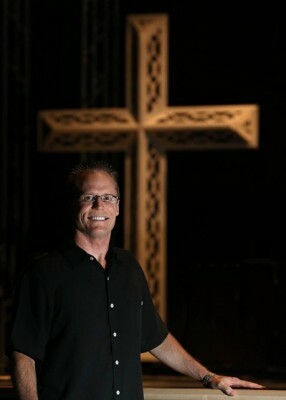 In 1985, Anderson and his wife, Thora, whom he met at GCU, began holding Bible studies in the living room of their home. The gatherings started with only 10 people but moved in less than two years into a retail strip center. Then, after another move, Vineyard relocated in 2002 to the 35-acre property where the church currently sits. Anderson is now a treasured alumnus of the University for what he did on and off the field — and a testimony to the way God works in people’s lives. “One of the things I have learned through the years at GCU is that I have a perception of people and God doesn’t always follow that perception,” Baker said.